For months I've been saying we are watching the implosion of the Republican Party at the national level due to Trump, and last night we saw the detonation. Ted Cruz gets booed. Think about all of this. 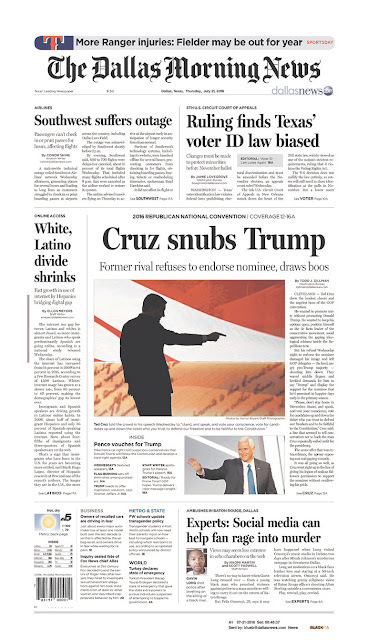 Donald Trump -- Donald Trump -- is the official nominee at the same convention where Ted Cruz is booed. Ted. Cruz. Booed. What a cluster. But I have a new found respect for Ted Cruz. He realizes the obvious: Trump is a fraud, and Trump can't win. And Cruz was not going to sell his soul like Perry, Abbott and Patrick. He will be proven correct and may very well be back in 2020 as the Republican nominee when the rest of the party wakes up. Then again, Cruz sucked up to Trump to no end at the beginning of the campaign expecting Trump to fold and then planning on taking his supporters. So I may need to re-think my new found respect. Trump was surprised that Cruz wouldn't endorse him? You call someone "Lyin' Ted" for months and then give that person the floor at your convention? "Trump's dead, baby. Trump's dead." Hot sports prediction: The Ranger's won't win the AL West. The Rangers won't make the wild card. The Rangers finish third in their division. The always conservative Fifth Circuit struck down (kind of) the Texas' Voter ID law yesterday and hardly anyone noticed. "We promise that this is a temporary thing and that it will in no way affect the quality of opinion writing we publish." The Dallas Morning News' "disclaimer" about blog posts appearing under the "Opinions" section of its website. I certainly do hope "that this" "thing" doesn't impact that quality writing. Side note: Couldn't a 10 year old kid fix this website problem in about two minutes? We have a leader in the clubhouse for Worst Comedic Performance in 2016: Mark Cuban last night. This is so bad that it must be watched. No wonder free agents distance themselves. Oh, come on. We're havin' fun here, no? I don't know much about the Russian track team being banned from the Olympics but when I heard the country's appeal was rejected by the "Court of Arbitration for Sport" my head almost exploded.